What do the leaders of Canada, the United States and Iran, a big gun and doughnuts have in common? Stay tuned...all shall be revealed. The United Nations in New York this week was the focus of considerable media attention. A guy who's name hardly anyone can pronounce, and couldn't care less if they do, who last year at the same forum denied the existence of the Holocaust was set to speak again. 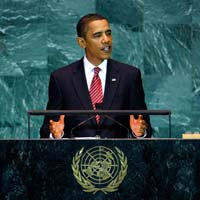 President Obama, fresh from fishing for compliments via a media saturation blitz, was set to make his maiden UN address. And Canada's PM skipped the whole affair in favour of a coffee and a doughnut, prompting many Canadian news outlets running the story to slug it "Doughnuts (okay, okay "donuts" for you Yanks) over Diplomacy". Obama, to his credit, despite waning public support at home demonstrated he still has the "it" factor internationally. As the Toronto Star editorialized "...Obama cut a bold figure on the world stage yesterday, delivering a forward-looking, energetic message to the United Nations General Assembly. George Bush has left the building." That fish musta been this big. Fresh from tete-a-tete-ing with Obama only the week before in Washington, Canadian Prime Minister Stephen Harper was nowhere to be seen. Far from cutting a bold figure, Harper was contributing to his wide one, chowing down on Tim Horton's doughnuts in Oakville, Ontario at a photo-op to announce the return to Canada of the Timbit. Many Canadians might be surprised to know their favourite Canadian icon has been owned by Wendy's for the last 15 years and only because of a vote of it's shareholders is it returning to Canadian turf to take advantage of Canadian tax legislation. Perhaps this is just the start. Maybe other American-owned Canadian icons will return. There's a rumour the Hudson's Bay Company could well be repatriated. But, as I often do, I digress. Back in New York, Iranian President Mahmoud Ahmadinejad was given the podium. Harper, enjoying a Timbit or two with his buds in Oakville had sent Foreign Affairs Minister Lawrence Cannon - his big gun, as it were - to replace him. But Cannon, consistent with Canadian policy, walked out to boycott the Iranian leader's speech. A-ha, all is revealed. Contrary to the majority of Canadian media reports, there may be one in the doughnut but there's no hole in our diplomatic efforts. If he was just going to walk out anyway, why would Harper travel all the way to NYC? Brilliant, Steve. And, instead, our PM basked in the glow of an appreciative electorate, thankful for the return of one of our native sons to our native land. Who knows. We start with Tim's and soon we can repatriate all our foreign-owned icons...bit by bit. 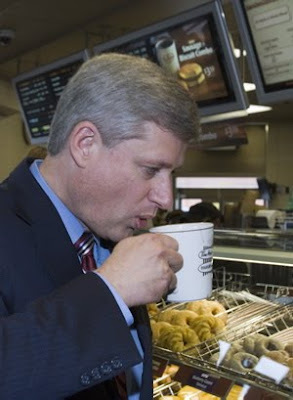 Perhaps the PM should hold out a Tim Horton's doughnut as an olive branch. Then maybe Ahmadinejad would be so wowed, he'd turn that nuclear facility into a Tim Horton's. Now that would be a great coup in international relations. You've got such a good handle on politics Noname. I always enjoy reading these posts. But I have to admit one thing. The thought of a donut (*smile from a Yankee) was very distracting. 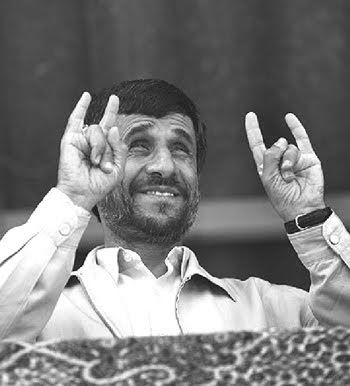 BTW, loved YOUR caption to Ahmadinejad pic...very funny! I like donuts!!! Or doughnuts, for you fancy people. Was that what I was supposed to get from that? Thanks for participating in my contest. You won! BTW, I voted for you in the blogspot contest. It looks like I'm gonna have to vote a couple more times as there are a couple of yahoos up there with over 100 votes. I don't believe I've ever seen a haircut trimmed so nicely around the ears. Oh, uh...where was I? Oh yeah, Wendy's is selling doughnuts. CatLady: As that great philosopher Homer (Simpson) likes to day: "dough!" Quirks: Thanks Quirky. I toyed with which way to go withthat caption. That's also the sign for Satan. But since the picture is of Satan a caption along those lines seemed redundant. 1)Canadians like to think they have a higher class doughnut than the Dunkin variety. 3) Hey thanks! Vote early, vote often as they say. Don: We call him Prime Minister Helmet Head! Loved this. Methinks you are a person after me own heart. TOS: Glad you enjoyed it. Seems when I write about politics it scares people off. A lot of Americans I know are surprised when I tell them-- pompously, I might add--that Horton's is American owned. They all think they're doing something uniquely Canadian when they go their for donuts. As for "Donuts over Dipolmacy," I might be a fan of that, too. And not just a way to spin free of an image problem. I like donuts. What can I say? Hey, you wanna know somethin' weird? My captcha word for this comment was "unckin." Isn't that pretty close to Dunkin' (Donuts)? Life is creepy sometimes, I tell ya. MikeWJ: You're a rarity Mike - an American who admits he's pompous! They're on to something. Ya just can't be mad while shoving a cruller down your pie-hole.